It started with a dragon made from recycled packaging materials. Michael Greene, who works in the Professional Center Library, had twisted the brown paper and added some colorful details to create the 8-foot long mythical beast. His colleague, Maureen Eggert, an associate director of the library, saw it and enlisted the help of Angie Hobbs, reference coordinator, to figure out how discarded books and other library materials might be creatively recycled. Thinking this would make a fun team-building project, Hobbs challenged the Professional Center Library staff to transform outdated law books and other materials into decorative and useful items for display in the library during the holiday season. 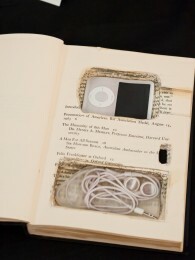 The results: More than 25 projects ranging from a holiday wreath made with 700 pages from an obsolete version of the U.S. Code to an iPod “safe” created by hollowing out small rectangular-shaped spaces in a 1924 legal reference book. Holiday chains made from microfilm decorate the central staircase. Gift wrap and gift bags made from dust jackets and book pages were created by Hobbs and acquisitions coordinator Gina Jarrett. 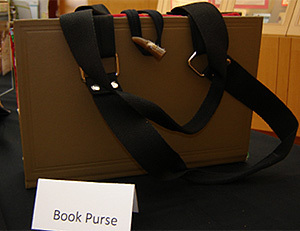 Hobbs also used one volume from the “Federal Supplement,” a set of reference books that are updated whenever changes in the law occur, to create a one-of-a-kind purse. Staff member Isbel Cruz-Chaundry created a hanging sculpture made from microfilm and microfilm reels. 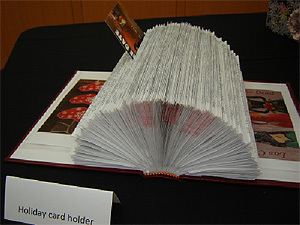 Reference Librarian Liz Johnson created a calendar planner using the rich maroon cover of a discarded book. 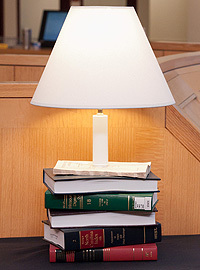 Stacks of books were used to make a lamp and a children’s reading table. Folded pages from a book became a gold-tinted Christmas tree-shaped table decoration. 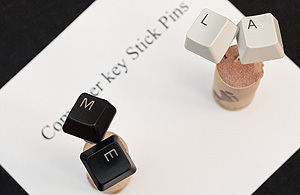 Eggert used the “enter” key from a discarded keyboard to make a key chain. As more and more resources are available in electronic form, libraries are pulling from the shelves more books and other materials they no longer need, Hobbs said. When the staff began culling outdated materials from the library’s collection this summer, they started planning and creating. Hobbs says the project was a fun way to engage the staff and students in thinking creatively about sustainability, but was not meant to replace their normal book-recycling program. The Professional Center Library and Z. Smith Reynolds Library contract with a company that recycles discarded books into newsprint and gray cardboard. The display also features legal books on sustainability and facts about book recycling, noting that every ton of paper that is recycled can save 17 trees and 3.3 cubic yards of landfill space. 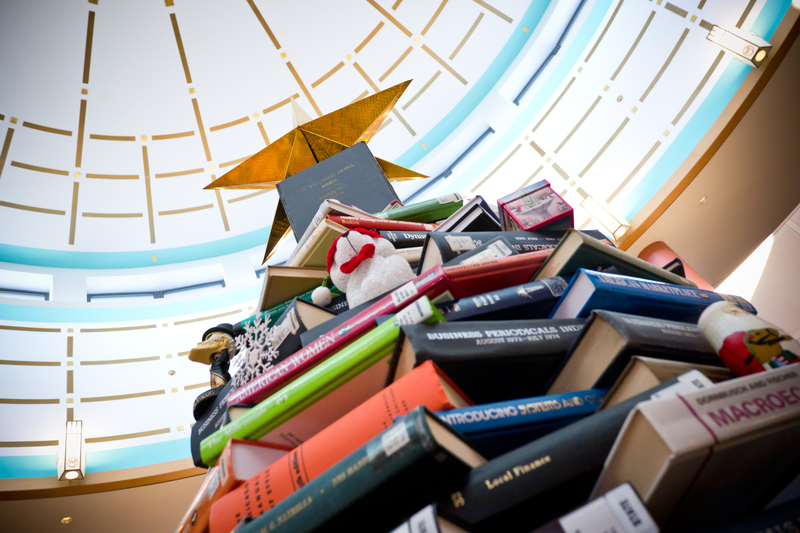 Just before Thanksgiving, the staff built a large tree of books for the center of the rotunda. 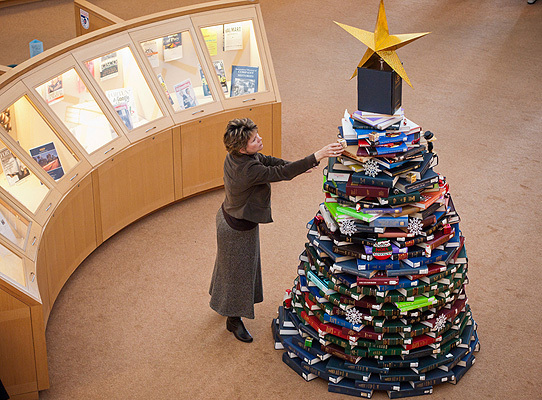 Library staff have been decorating it with small ornaments ever since. 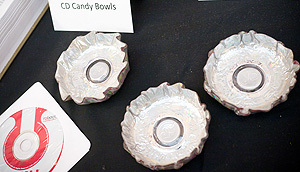 The items will be on display through January.